A secret operation assigned for every brave Sagara Squadron Combatant with guts and bravery, and Intel with the brilliant mind to enlist their name in the toughest mission ever. What is Operation Skull & Bombs? 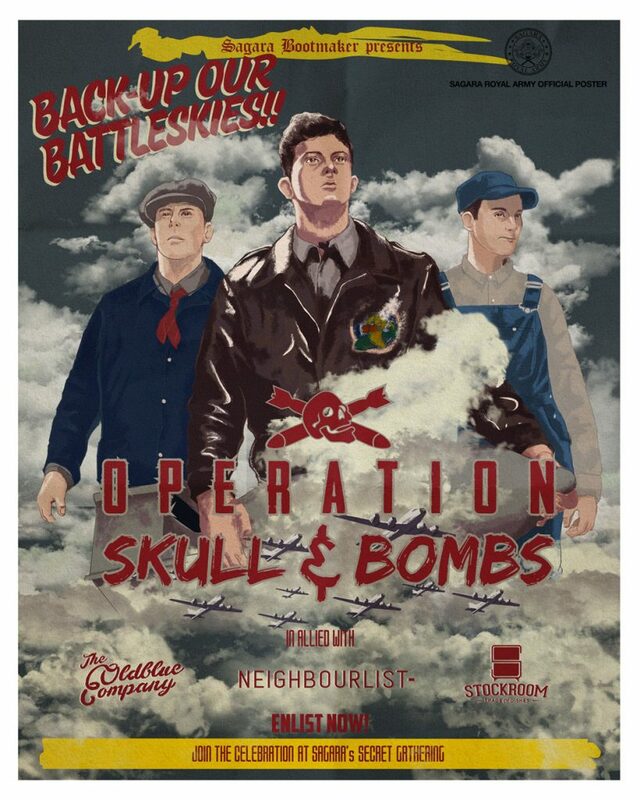 Operation Skull & Bombs (OSNB) is a Instagram-based contest open for EVERY Sagara’s Squadron*. Every contestant will get a mission to post a picture of their Sagara Shoe/Boot with specified theme in their Instagram account to collect codes (awarded every mission completed). Once the codes completed, contestant must compete each other to be the fastest to claim the prize. Warbirds Task Force must collect the NUMERICAL-BASED WEB ADDRESS and ANSWER THE QUESTIONS ON THE WEB CORRECTLY; the FASTEST contestant will claim the main prize. Warhorse Task Force must collect the LONGITUDE AND LATITUDE COORDINATE, GO TO THAT LOCATION** AND GET THE MEDALLION PIECE to claim the main prize. BOTH THE TASK FORCE WILL GET SAME SIDE MISSION (POST A PICTURE WITH SPECIFIED THEME IN THEIR INSTAGRAM) TO GET THE CODE, SO ALL OF THE TASK FORCE DON’T NEED TO BE IN BANDUNG TO ACCOMPLISH THE SIDE MISSION (TO GET PARTIAL CODE). 1. WARHORSE TASK FORCE ; AFTER COLLECTING THE LATITUDE AND LONGITUDE COORDINATES, THEY MUST GO TO THAT LOCATION TO GET THE MEDALLION PIECE AND CLAIM THE PRIZE. 2. WARBIRDS TASK FORCE ; AFTER COLLECTING THE WEB ADDRESS CODE, THEY HAVE TO OPEN THE WEB AND ANSWER THE QUESTION, THE FASTEST WILL CLAIM THE PRIZE. SRA (Sagara Royal Army) will held a celebration party in secret location ONLY for Operation Skull and Bombs soldiers and allies who helps us to win the war. There will be a several activities for every attended guests like mini games for all attended guest to live up the party, there’s also some prizes for mini games winner. Before you join the war, make sure you have your own ammunition (Sagara Shoe/Boot) either it’s a new or worn pair. Make sure you turn on the notification in @sagarabootmaker account to make sure you’ll get latest update of the mission. SRA Double Agent will inform you through Instagram Direct Messages. One of SRA greatest assets seized by the enemy during the war and we need person as Intel for reconnaissance mission to break enemy’s code and re-capture SRA assets from their hands. Intel from Warbirds Task Force will assigned for several missions. Each mission completed, Intel will get QUESTIONS WITH NUMERICAL ANSWER : (ex. When did the World War 2 started? And the answer is 1939). Intel must collect the answer from every mission to get a NUMERICAL-BASED WEB ADDRESS which you can open in your browser to win the contest and claim the prize. Only THE FASTEST Intel who can claim the main prize. There’s also a special prize for a Intel who can provide THE BEST PICTURE, and every Intel who ACCOMPLISH ALL THE MISSION will get complementary prize from SRA. SRA precious Medallion pieces lies in secret location somewhere in the battlefield arena. Combatant from Warhorse Task Force will assigned for several missions. Each mission completed, combatant will get PARTIAL LATITUDE AND LONGITUDE COORDINATE from SRA Double Agent. To get COMPLETED LATITUDE AND LONGITUDE COORDINATE WHERE THE MEDALLION LOCATED, Combatant MUST ACCOMPLISH ALL MISSIONS from SRA. Only THE FASTEST Combatant who GET THE MEDALLION PIECE can claim the main prize. There’s also a special prize for a Combatant who can PROVIDE BEST PATINA, and every Combatant who ACCOMPLISH ALL THE MISSION will get a complementary prize from SRA and RIGHTS to join the celebration in our secret base somewhere in Bandung City, SRA Homeland. Every soldier in the world known with its obedience to the rules and regulation, make sure you read and understand SRA Rules and Regulation for Operation Skull & Bombs. Contestant MUST HAVE SAGARA’s SHOE/BOOT for war ammunition, no matter how the condition, either new or worn. Contestant can use MORE THAN ONE SAGARA’s SHOE/BOOT. Operation : Skull and Bombs is INSTAGRAM-BASED CONTEST, so make sure every contestant have their own Instagram account to join this contest. Contestant MUST UNLOCK their Instagram profile (DO NOT SET TO PRIVATE ACCOUNT), so our team can supervise the contest. You only have rights to choose ONE between two Task Force : Warhorse and Warbirds. SRA divide the operation with two Task Force, and Warbirds specifically created to accommodate contestant who lives (relatively) far away from Bandung City or for some reason doesn’t have a chance to join the secret gathering but excited to join this operation. SAGARA Secret Gathering will be specified to Warhorse Task Force. Warbirds Task Force member still have rights to join the gathering, but they have to confirm to our team first. We will inform the missions from Instagram as the MAIN CHANNEL. Make sure every contestant standby in our Instagram (turn on notification is recommended) BECAUSE THE MISSION WILL COME UP ANYTIME. Every contestant must have completed the mission before the deadline. If contestant completed the mission AFTER DEADLINE PASSED, they’ll considered fail. Warhorse Task Force member will get PARTIAL LONGITUDE AND LATITUDE COORDINATE where MEDALLION LOCATED, the coordinates will completed if Combatant ACCOMPLISHES ALL THE MISSION. Warbirds Task Force member will get some HISTORICAL QUESTION WITH NUMERICAL ANSWER, Intel must ANSWER CORRECTLY, COLLECT and ACCOMPLISH ALL THE MISSION to get completed NUMERICAL-BASED WEBSITE ADDRESS to claim the prize. Warhorse Task Force: FIRST contestant who GET THE MEDALLION PIECE LOCATED IN SAGARA’s SECRET GATHERING. Warbirds Task Force: FIRST contestant who OPEN THE WEB, ANSWER THE QUESTIONS CORRECTLY, AND FILL THE DATA. SAGARA’s TEAM and ALLIES* has ABSOLUTE RIGHT to decide which contestant who have the best patina and provide the best picture to get the prize. * General of the Army Ahmad “Yax” Hadiwijaya from Oldblue Co., General of the Air Force Gregorius Andre from Neighbourlist, and Fleet Admiral Jean Thosan from Stockroom. SRA will held a celebration party in secret location for every Operation : Skull and Bombs soldiers and allies who helps us to win the war. Every guests have a privilege to see the presentation and the product itself. They also can be a first adopter of Sagara’s newest Boondockers article. Important notice for every Sagara Squadron that these article only limited to 9 pairs, but 1 pair taken by Supreme Commander : General Bagus Satrio and 1 pair for Warhorse Task Force Winner, so technically it’s 7 pairs left. SRA create a mini game for all attended guest to live up the party and there’s also some prizes for mini games winner. Sebuah operasi rahasia yang ditugaskan kepada setiap kombatan dan intel Sagara Squadron terbaik dan memiliki kemampuan diatas rata-rata untuk menuntaskan misi paling menantang yang pernah ada. Apa itu Operation Skull & Bombs? Operation Skull & Bombs (OSNB) adalah kontes berbasis Instagram yang terbuka untuk SETIAP anggota Sagara Squadron*. Setiap kontestan akan mendapatkan misi untuk mengunggah foto sepatu Sagara dengan tema tertentu lewat akun Instagram mereka. Setiap misi yang dituntaskan, kontestan akan mendapatkan kode, dimana di akhir kontes setiap kontestan akan berkompetisi untuk memecahkan kode tersebut dan mendapatkan hadiah utama. Terdapat dua tim dimana kontestan hanya dapat memilih satu diantaranya. Warbirds Task Force akan bertugas untuk mengumpulkan ALAMAT WEBSITE BERBASIS ANGKA dan MENJAWAB PERTANYAAN PADA WEBSITE tersebut setelah SETELAH MENYELESAIKAN SEMUA MISI, kontestan yang TERCEPAT menjawab pertanyaan akan mendapatkan hadiah utama. Warhorse Task Force akan bertugas untuk mengumpulkan potongan KOORDINAT LONGITUDE DAN LATITUDE, DATANG KE LOKASI** TERSEBUT DAN MENDAPATKAN POTONGAN MEDALI YANG TERSEMBUNYI untuk mendapatkan hadiah utama dari kontes ini. KEDUA TASK FORCE AKAN MENDAPATKAN SIDE MISSION YANG SAMA (MENGUNGGAH FOTO DENGAN TEMA TERTENTU DI INSTAGRAM) UNTUK MENDAPATKAN KODE, JADI KEDUA TASK FORCE TIDAK DIHARUSKAN BERADA DI BANDUNG UNTUK MENYELESAIKAN SIDE MISSION. 1. WARHORSE TASK FORCE ; SETELAH MENGUMPULKAN POTONGAN KOORDINAT LATITUDE DAN LONGITUDE, MEREKA HARUS DATANG LANGSUNG KE LOKASI TERSEBUT DAN MENDAPATKAN POTONGAN MEDALI UNTUK MEMENANGKAN LOMBA. 2. WARBIRDS TASK FORCE ; SETELAH MENGUMPULKAN KODE ALAMAT WEBSITE, MEREKA HARUS MEMBUKA WEB DAN MENJAWAB PERTANYAAN YANG ADA DI WEBSITE TERSEBUT, YANG TERCEPAT AKAN MENDAPATKAN HADIAH UTAMANYA. SRA (Sagara Royal Army) akan mengadakan gathering di lokasi rahasia yang HANYA diperuntukkan kepada setiap kontestan Operation Skull & Bombs dan para pendukung yang telah membantu SRA untuk memenangkan pertempuran ini. Akan ada beberapa aktivitas yang telah disiapkan untuk setiap tamu yang hadir seperti pesta barbeque dan mini games. Disana juga akan ada beberapa hadiah untuk pemenang mini games. Sebelum mendaftarkan diri ke dalam peperangan, pastikan Anda memiliki amunisi (Sagara’s Shoe/Boot) baik kondisi baru maupun yang sudah worn-out. 3. Bagaimana cara mendaftarkan diri untuk SRA Operation Skull & Bombs? 4. Dimana SRA akan menginformasikan detil setiap misi? Instagram : @sagarabootmaker Pastikan Anda mengaktifkan fitur “Turn On Notification” di Instagram Sagara untuk memastikan Anda mendapatkan informasi terbaru terkait misi yang akan diberikan. 5. Dimanakah SRA akan menginformasikan potongan kode untuk setiap Intel dan Kombatan yang menyelesaikan misi? SRA Double Agent akan menginformasikan kode lewat Direct Message Instagram. PERINGATAN : PASTIKAN UNTUK TIDAK MENGUNCI (SET TO PRIVATE) PROFIL INSTAGRAM ANDA. Salah satu asset terbesar SRA direbut oleh musuh saat perang berlangsung dan kami membutukan Intel yang ditugaskan dalam reconnaissance mission untuk memecahkan kode dari musuh dan merebut ulang asset SRA dari tangan mereka. Intel dari Warbirds Task Force akan mendapatkan beberapa misi. Setiap misi yang diselesaikan, Intel akan mendapatkan PERTANYAAN DENGAN JAWABAN NUMERIK : (Cth : Pada Tahun Berapa Perang Dunia 2 Dimulai? Dan jawabannya adalah 1939). Setiap jawaban adalah potongan dari ALAMAT WEBSITE BERBASIS ANGKA yang dapat dibuka di browser setiap kontestan dan hanya bisa dibuka jika kode sudah terkumpul. Hanya Intel yang TERCEPAT dalam membuka website dan menjawab pertanyaan di website tersebut yang dapat memenangkan hadiah utamanya. SRA juga menyediakan hadiah spesial untuk Intel yang dapat menyajikan FOTO TERBAIK dan setiap Intel yang MENYELESAIKAN SEMUA MISI. Potongan medali berharga miliki SRA ada di lokasi tersembunyi diantara medan peperangan. Kombatan dari Warhorse Task Force akan mendapatkan beberapa misi. Setiap misi yang diselesaikan, Kombatan akan mendapatkan POTONGAN KOORDINAT LATITUDE DAN LONGITUDE dari sebuah lokasi. Untuk dapat mendapatkan KOORDINAT LATITUDE DAN LONGITUDE LENGKAP DIMANA LOKASI POTONGAN MEDALI TERSEBUT BERADA, Kombatan harus MENYELESAIKAN SEMUA MISI dari SRA. Hanya Kombatan yang TERCEPAT dalam MENDAPATKAN POTONGAN MEDALI yang berhak untuk mendapatkan hadiah utama. Terdapat hadiah spesial untuk Kombatan yang dapat MENYAJIKAN PATINA TERBAIK. Kombatan yang MENYELESAIKAN SEMUA MISI juga akan mendapatkan hadiah dari SRA dan HAK untuk mengikuti Sagara’s Secret Gathering di lokasi rahasia sekitar kota Bandung. Setiap prajurit dikenal dengan kepatuhannya terhadap regulasi dan aturan, pastikan Anda membaca dan memahami peraturan dan regulasi SRA untuk Operation Skull & Bombs. Kontestan HARUS MEMILIKI SEPATU SAGARA untuk amunisi peperangan, apapun kondisinya, baik baru maupun telah worn-out. Kontestan dapat menggunakan LEBIH DARI SATU PASANG SEPATU SAGARA. Operation Skull & Bombs adalah KONTES BERBASIS INSTAGRAM, pastikan setiap kontestan memiliki akun Instagram untuk mengikuti kontes ini. Profil akun Instagram kontestan HARUS OPEN FOR PUBLIC (TIDAK DIATUR SEBAGAI PRIVATE ACCOUNT) agar tim kami dapat melakukan supervisi selama kontes. Setiap kontestan HARUS menggunakan hashtag #OperationSkullAndBombs dan TASK FORCE YANG DIPILIH (#WarhorseOSNB untuk Warhorse ; #WarbirdsOSNB untuk Warbirds). Kontestan hanya berhak untuk memilih SATU dari dua Task Force : Warhorse dan Warbirds. SRA membagi operasi ini kedalam dua Task Force, dan Warbirds secara khusus dibuat untuk mengakomodasi kontestan yang tinggal relatif jauh dari Bandung atau karena alasan tertentu tidak memiliki kesempatan untuk mengikuti secret gathering tetapi tertarik untuk mengikuti kontes ini. SAGARA Secret Gathering secara spesifik diadakan untuk setiap kontestan dari Warhorse Task Force. Warbirds Task Force tetap memiliki hak untuk mengikuti gathering ini dengan catatan melakukan konfirmasi terlebih dahulu ke tim kami. Kami akan menginformasikan setiap misi lewat Instagram (@sagarabootmaker) sebagai KANAL UTAMA. Pastikan setiap kontestan untuk siaga karena MISI AKAN MUNCUL KAPAN SAJA TANPA PERINGATAN AWAL. Setiap kontestan harus menyelesaikan misi SEBELUM DEADLINE. Jika kontestan menyelesaikan misi SETELAH DEADLINE YANG TELAH DITENTUKAN, maka kontestan akan dinyatakan gagal. Tim kami akan memberikan POTONGAN kode setelah deadline setiap misinya kepada kontestan yang berhasil menyelesaikan misi sebelum deadline berakhir. Anggota Warhorse Task Force akan mendapatkan POTONGAN KOORDINAT LONGITUDE DAN LATITUDE dimana POTONGAN MEDALI BERADA. Kombatant harus MENYELESAIKAN SEMUA MISI UNTUK MELENGKAPI KODE KOORDINAT dan MENDATANGI LOKASI TERSEBUT UNTUK MENDAPATKAN POTONGAN MEDALI untuk mendapatkan hadiah utama. Anggota Warbird Task Force akan mendapatkan PERTANYAAN HISTORIKAL DENGAN JAWABAN NUMERIK/ANGKA. Intel harus MENYELESAIKAN SEMUA MISI, MENJAWAB DENGAN BENAR, dan MENGUMPULKAN KODE TERSEBUT untuk dapat membuka ALAMAT WEBSITE BERBASIS NUMERIK/ANGKA dan mendapatkan hadiah utama. Warhorse Task Force : Kontestan PERTAMA yang MENDAPATKAN POTONGAN MEDALI di LOKASI SAGARA’s SECRET GATHERING. Warbirds Task Force : Kontestan PERTAMA yang MEMBUKA WEBSITE, MENJAWAB PERTANYAAN DENGAN BENAR, dan MENGISI DATA. SAGARA’s TEAM and REKAN* memiliki HAK PENUH untuk menentukan siapa kontestan yang mendapatkan BEST PATINA dan BEST PICTURE. * General of the Army Ahmad “Yax” Hadiwijaya dari Oldblue Co., General of the Air Force Gregorius Andre dari Neighbourlist, and Fleet Admiral Jean Thosan dari Stockroom. Intel yang dapat memberikan Best Picture selama misi akan mendapatkan SRA Complementary Asset sebagai penghargaannya. SRA akan mengadakan pesta perayaan di lokasi rahasia untuk setiap prajurit yang terlibat di Operation Skull & Bombs dan Rekanan yang membantu kami untuk memenangkan peperangan. Setiap tamu akan mendapatkan privilege untuk melihat presentasi dan produk Sagara Civilian Boondockers secara langsung. Mereka juga dapat menjadi first adopter untuk artikel Boondocker terbaru dari Sagara. Informasi penting untuk setiap Sagara Squadron : Sagara Civilian Boondockers hanya diproduksi terbatas (9 pairs), dan 1 pair telah di klaim oleh Supreme Commander : General Bagus Satrio dan 1 pair untuk pemenang dari Warhorse Task Force, secara teknis produk ini hanya tersisa 7 pairs. SRA membuat mini games untuk setiap tamu untuk memeriahkan suasana dan tentu ada beberapa hadiah yang telah disiapkan untuk pemenang mini games. Follow us on social media for unmissable posts from the heart of Sagara Bootmaker !